Persistence Market Research analyzes the global ECG and EEG testing market in a new publication titled “ECG and EEG Testing Market: Global Industry Analysis and Forecast, 2016–2024”. This study provides data for 2015 along with a forecast for the period 2016–2024. The main objective of the report is to identify dynamics in the market and provide recent updates and insights affecting various segments of the global ECG and EEG testing market. To provide better understanding of the market, the report also includes an analysis of drivers, restraints, and trends studied across key regions namely Asia Pacific, North America, Europe, and rest of the world which influence the current market scenario and future status of the global ECG and EEG testing market over the forecast period. The global ECG and EEG Testing market report begins with an executive summary giving the report data overview and the market taxonomy or segments covered in the report. It is followed by an overview of market dynamics of the global ECG and EEG Testing market, which includes Persistence Market Research’s analysis of key trends, drivers, restraints, and opportunities that are influencing the growth of the global ECG and EEG Testing market. It also includes an insight into test pricing for various sleep tests that utilize EEG and ECG such as polysomnography. Impact analysis of key growth drivers and restraints based on the weighted average model has been included in the global ECG and EEG Testing market report after detailed analysis of individual regions to better equip readers with meaningful insights on ongoing developments in the global ECG and EEG Testing market. A detailed analysis has been provided for these segments in terms of market size, Y-o-Y growth rate, absolute $ opportunity, and BPS analysis. The report also analyzes the global ECG and EEG testing market by region and provides a market outlook for 2016–2024. The report further studies the impact of drivers and restraints in each region. The different sections—by test type, by service type, by end user, and by region—evaluate the present scenario and future growth prospects of the global ECG and EEG Testing market for the period 2016–2024. In the final section of the report on the global ECG and EEG Testing market, a competitive landscape is included to provide report audiences with a dashboard view based on categories of providers in the global ECG and EEG testing market. Key categories of providers covered in the report are diagnostics service providers such as hospitals, sleep clinics, mental healthcare monitoring organizations and other centers. Detailed profiles of the providers are also included in the scope of the report to evaluate their long- and short-term strategies, key offerings, SWOT analysis, and recent developments in the global ECG and EEG Testing market. The forecast presented here assesses the total revenue by value and volume across the ECG and EEG testing market. To offer an accurate forecast, the report starts by sizing up the current market, which forms the basis of how the global ECG and EEG Testing market is expected to develop in the future. Given the ever-fluctuating nature of the global economy, the report not only conduct forecasts in terms of CAGR, but also analyzes the market based on key parameters such as year-on-year (Y-o-Y) growth rates to understand the predictability of the market, and to identify the right opportunities across the global ECG and EEG Testing market. Another key feature of this report is an analysis of all key segments in terms of absolute dollar opportunity, critical for assessing the level of opportunity that a provider can look to achieve, as well as to identify potential resources from a service perspective in the global ECG and EEG Testing market. Further, to understand key market segments in terms of global growth and adoption of ECG and EEG testing, Persistence Market Research has developed a unique market attractiveness index to help providers identify real market opportunities. Electrocardiogram (ECG) is a test that tests the electrical activity of the heart and diagnoses abnormalities in cardiac functioning. Electroencephalography (EEG) is used to calculate the electrical activity of the brain. ECG and EEG devices tracked in this report are used to calculate parameters vital for sleep study. Sleep study refers to the type of tests used to diagnose sleep disorders by analyzing various physiological parameters. It is also used to measure mental health monitoring. Various disorders such as Parasomnia, Hypersomnia, Circadian Rhythm Sleeping Disorders and others are discussed in this report. The increasing prevalence of sleep disorders and mental disorders worldwide is the main factor responsible for increase in the market of ECG and EEG Testing over the forecast period. The global market for ECG and EEG Testing is anticipated to represent an absolute dollar opportunity of US$ 177 Mn in 2017 over 2016 and incremental opportunity of nearly US$ 2,000 Mn between 2016 and 2024. The market is projected to grow from nearly US$ 4,000 Mn in 2015 to about US$ 6,000 Mn by 2024 end. This represents a CAGR of 5.1% in terms of value over the forecast period. Increasing usage of ECG and EEG testing in psychiatric disorder for sleep disorder symptoms and to determine best treatment options is anticipated to create more opportunity for sleep service providers across the globe. The ECG Testing segment is projected to register a 4.2% CAGR over the forecast period and be valued at more than US$ 2,000 Mn by 2024 end. 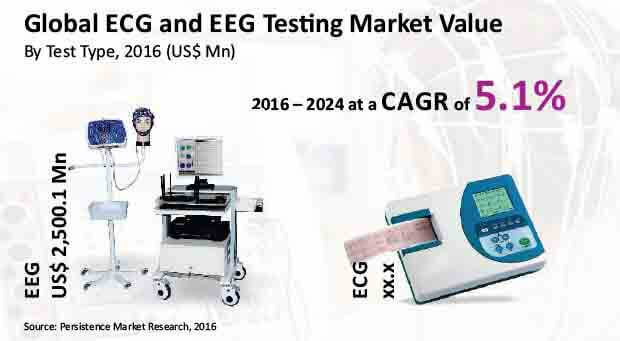 The EEG Testing segment is the largest segment among the global ECG and EEG Testing market’s test type segments, which is estimated to represent nearly US$ 4,000 Mn (more than 60% share of the global market) by 2024, registering a CAGR of 5.6% over the forecast period. ECG Testing segment revenue in the global ECG and EEG Testing market is expected to grow 1.4x by 2024 end as compared to that in 2016. EEG Testing segment revenue in the global ECG and EEG Testing market is expected to grow 1.5x by 2024 end as compared to that in 2016. The ECG segment is expected to create absolute dollar opportunity of nearly US$ 60 Mn in 2017 over 2016. The EEG segment is expected to create absolute dollar opportunity of nearly US$ 125 Mn in 2017 over 2016. The EEG Testing segment was predicted to dominate the global ECG and EEG Testing market in revenue terms in 2016, and the trend is projected to continue throughout the forecast period. The ECG Testing segment accounted for 36.7% value share in 2015 and is projected to account for 34.3% share by the end of 2024. ECG Testing segment is expected to remain the least attractive segment in the global ECG and EEG Testing market in revenue terms with an attractiveness index of 0.7 over the forecast period. Sleep study and ECG and EEG testing for mental health monitoring includes measurement of electrical brain and heart activity in patients with mental disorders. These tests are performed in order to check the role of sleep apnea in early stages of mental disorders or to check the dosage regimen for treatment and to determine the best treatment options.